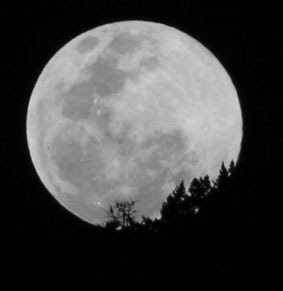 Please join Avimor's Conservation Director, Charlie Baun, on Saturday, October 3rd for a Moonlight Hike at Avimor. Meet at The Avimor Town Lake. We will hit the trail by 7:00pm so we can watch the Sunset. The 99% full moon should provide all the light we need. You can bring a flashlight just in case. There will be a fire barrel at the mid-point. The hike will be apprx. 4 miles round trip, so wear good shoes or hiking boots and dress appropriately for the weather. My husband is really getting into birding and I need to get a new set of binoculars so I can actually see the birds! Any suggestions? Avimor Bird Guy: Jan, I'm sorry that you have lost your husband to the birding addiction. My wife and mother-in-law can relate. It is a nerdy hobby, but it helps me give me the thrill of the hunt while enjoying the outdoors. When it comes to binoculars...if you have even the faintest desire to enjoy birding...it is worth it to buy binoculars in the $300 range. You will see more and see it so much better...trust me! I spent the first two years of birding with $60 Bushnell's and they were horrible in comparison. I love my Eagle Optics Ranger SRT's 8x42. My father-in-law loves his Nikon Monarch 10x42's. I think Audubon Equinox binoculars are in that same price and quality range. In the binocular world there is an incredible difference in quality and capability between $100 optics and $300 optics. Some big-time birders buy name brands that cost $1500+, but the difference in value from the $300 optics is not that much. 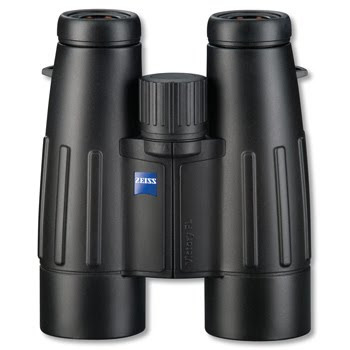 But if I had the money, I'd go for the dream binoculars, Zeiss Victory FL's which run about $2400 (I hear they cook and clean for you). When it comes to the magnification it is best to stick with 7x35, 8x42, or 10x42. These sizes give you the best amount of light and color transmission, best field of view, and best close-focus. 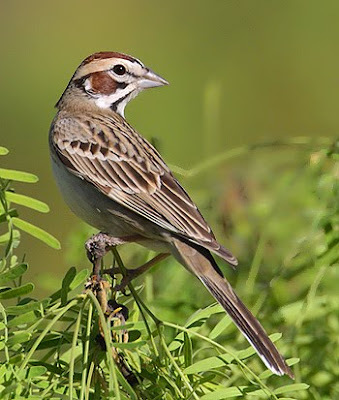 All summer long I have seen a flock of about a dozen sparrow-type birds around the Avimor Town Lake and in the wildflowers on the vacant commercial lot across the street. Earlier in the summer I positively identified them as Lark Sparrows and I had kind of become accustomed to seeing them. As Summer turned to Autumn I continued to see sparrow-types in this area and I wouldn't even put my binoculars on them because I just "knew" they were Lark Sparrows...at least I thought I knew. 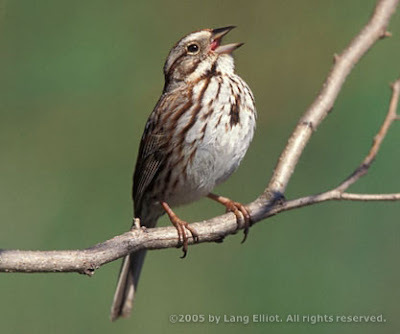 Even on our September bird walk I pointed them out to the folks as Lark Sparrows. I even directed them to look at the unique face pattern. I actually looked at them through my optics this time and something struck me as different about them, yet I chalked it up to them probably being juvenile Lark Sparrows. Well, late last week I took a longer look at them and realized they were not Lark Sparrows at all. They had streaky breasts and white bellies, still a strong face pattern, but not as much as an adult Lark Sparrow. What are these confounded sparrows?! Song Sparrows look similar to what I was seeing, but they don't act like them. 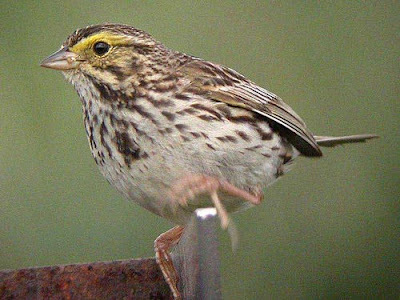 Could they be Savannah Sparrows? I have only seen them individually before and never in a flock. So I took another look at them today and I noticed a yellow eye-brow. I had my father-in-law double check in his book "Sparrows of the United States and Canada". Savannah Sparrows indeed! I'm embarrassed that the Bird Walk group probably thought I didn't know what in the heck I was talking about and now I have a vote of zero-confidence. Oh well. You sure learn a lot by being wrong sometimes! When I first got into birding while living in Arizona, I cruised on down to the Superstition Springs Center mall and browsed through all the bird field guides at Borders. I knew nothing of field guides, how to use them, or how to compare them. 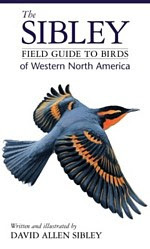 The Sibley Field Guide to Birds of Western North America just struck me as a good one. I liked the paintings, the descriptions, the maps, and the layout of the pages. It looked very intuitive and the price was reasonable, so I bought it! Since that day several years ago I have lost three of them and purchased a couple as gifts for other beginning birders. It is still my go-to field guide. No field guide can even begin to display all the possible variations of birds as they may appear at sundry stages, but so far, Sibley's has been there for me to identify every bird that I have come across. I just bought my 4th copy. I may just have to permanently chain it to my body so I don't lose it this time. Saturday night, when I finally arrived home from my part-time job at RC Willey and from a quick stop at the grocery store, while unloading the groceries I heard the hooting of a couple of Great Horned Owls down along the creek. I have been seeing them recently on my morning walks and I've been noticing a lot of white-wash on the paver sidewalks below the street lights. I've been having a hankering to try calling owls to see what variety of species we have here at Avimor. So, last night I caved into my owl curiosity and took my Zune MP3 player loaded with all the owl sounds from BirdJam and plunked myself down at Foothills Heritage Park. Before I even played any of the calls I had two Great Horned Owls hooting away and one turned out to be sitting up high on an old dead snag just 20 yards away. I played a wide variety of owl calls, but nothing else responded. The highway noise was still a bit overwhelming even at 9 o'clock at night, so when my bottom got too cold I determined to call owls from the comfort of my 92' Dodge Dakota pick-up truck with 345,000 miles on it. I drove up Spring Valley Creek trail to where the road ends and started playing the owl calls again. This time I was rewarded with a Western Screech-Owl returning the call. I figure it must have been about 100 yards away. 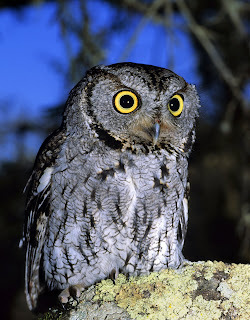 I am hoping to be able to call in Northern Saw-whet owls, Flammulated Owls, maybe even a Long-eared Owl. I think I'll need to get up a little closer to the pine-treeline to get a wider variety of species to respond. I know the folks at the IBO have been doing owl banding using the call method to lure them in. It will just take understanding the habitat, a lot of patience and experimenting. One of the great joys of birding is noting the coming and going of the migrating species signaling the change in season. A first-of-season (FOS) Dark-eyed Junco returned to Avimor this morning! I saw it flitting from tree to tree along Streams Edge Way. Once you learn to recognize it, they have a pretty distinct chirp. Dark-eyed Junco's are very common winter birds here at Avimor. You can see them at your feeder and all along Spring Valley Creek gleaning seeds from the various plants. They must like cooler weather as they tend to hang out in the Treasure Valley from late September through March. During the summer I will sometimes find them in cooler mountain areas among the pines. There are a few subspecies of Dark-eyed Junco which can be seen in this area. I believe the one I was looking at this morning was an Oregon variety. You can learn more at All About Birds. 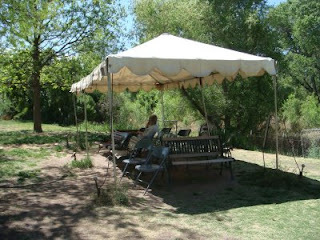 A few years ago, while birding in Patagonia, Arizona, we made the "must-see" stop at Marion Paton's residence. Mrs. Paton, whose property backs up the nature preserve, has been feeding birds in her backyard for decades and all kinds of rare birds stop in there. I think I added a dozen life birds while sitting in the chairs under the canopy there in her backyard along with dozens of other birders from all over the world. She has a wide variety of feeders with different kinds of seed, hummingbird feeders, and platform feeders with chuncks of fruit to lure the greatest variety of birds into her place. That particular afternoon a cute little group of eldery ladies were there watching the birds. By the looks of their inexpensive binoculars and their Golden Book Field Guides we could see that they were sweet old ladies that simply enjoyed the birds and not gung-ho listers*. I was sitting next to one of the ladies who said, "I've been watching this red bird forever down on that platform feeder. It hasn't moved a bit. Can you see what it is?" I put my binoculars on it and replied, "That's a pomegranate." "Oh. Okay." And she begin to browse through her Golden Book of birds. After a few frustrating minutes she leaned over and asked, "I've looked all over in the book and I just can't find it." We all had a good laugh with her after she realized that the pomegranate was just a piece of fruit. 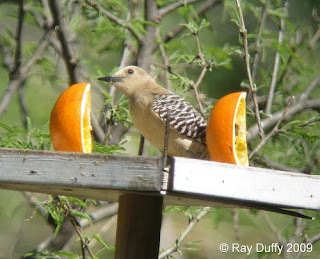 (below is a photo showing the actual platform feeder at the Paton residence, but this time with oranges. 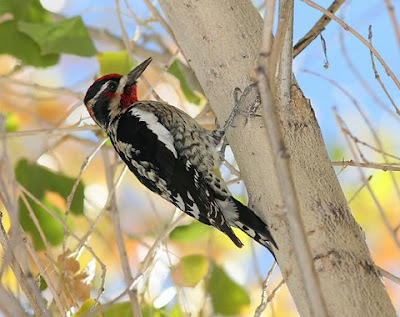 * "Lister" is birding jargon for a birder whose primary focus is seeing as many birds as they can either in a day, at a location, or chasing around the globe to add to their life list of bird species seen. I recommend a visit to the IBO for every birder and non-birder alike. The steep, rutty dirt road is pretty tough and a 4-wheel drive high-clearance vehicle is preferred, but a cute little family did make it up their in a minivan this morning. The location and views are beautiful and the birding is excellent. 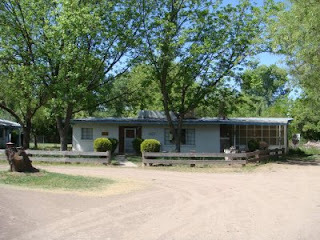 The mountain is right at the tree line and views can be had of the entire Treasure Valley. The staff at the IBO are incredible. They are super friendly, super knowlegable, do great with kids, and really know how to show people a fascinating time with birds. They have a series of mist nets set up in the brush to catch birds as well as nets to catch birds of prey. The birds are treated with the utmost care while they are removed from the nets, leg banded, measured many different ways, and then gently released back into the woods. We got to see up close and in the hand several different species. This morning they were catching dozens of Ruby-crowned Kinglets, White-crowned Sparrows, juvenile Western Tanagers, and Mountain Chickadees. While I was observing at the banding station they had a very cute little Golden-crowned Kinglet, a Lincoln's Sparrow, a pink-sided Dark-eyed Junco, and an Oregon Dark-eyed Junco. They also caught a Wilson's Warbler and a Townsend's Solitaire. It is so amazing to hold these birds in your hand. They also do hawk-watching from the hilltop. I saw my life bird #310 up their today, the Broad-winged Hawk. We also had a flyover of dozens Townsend's Solitaires and even an early Varied Thrush. My eBird list today had over 30 different species, and a few more were seen or heard by others. All I can say is that I can't wait to go back again! Thank you Jay Carlisle, Jay's mom from Connecticut, Caroline, Nate, Erin, the guy from Upstate New York, the guy from PA, and the couple other of you whose names didn't stick in my brain. "I noticed a picture of a wall with holes on your home page.... There is a wall like that right by my house... I have always wondered what type of bird does that. Can you tell me?" Thanks for asking Mary! The picture shows a Bank Swallow nesting site. Bank Swallows like to tunnel into the sand or dirt banks to nest. Barn Swallows tend to build mud nests under bridges or under protected covers of buildings. We've had Barn Swallows nest in the covered entryways of a couple of homes here at Avimor. If you don't want the mess, I'd encourage you knock the nests down before they finish building them and lay eggs. Cliff Swallows build gourd-shaped mud nests on very sheer rocky cliffs. At Avimor, we currently have a few Barn Swallows swooping around, but the other swallow types have already migrated south. To learn quick-ID tips for swallows that can be seen in our area click here. Because Avimor is up in the foothills north of Eagle, Idaho, except for man-made ponds and a couple wide spots in the creek, we don't have much open water. 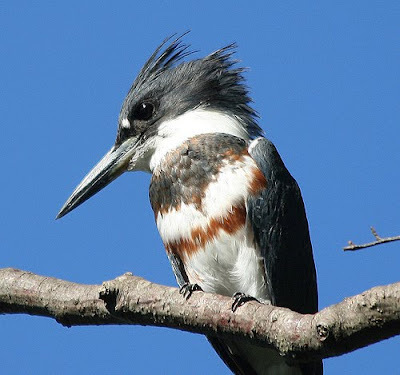 That's why I was surprised to first hear the unmistakable rattling cry and then to see the Belted Kingfisher flying over Spring Valley Creek this morning. Perhaps it was on its way from the Payette River to the Boise River. The Belted Kingfisher is Avimor's official record bird #93. An interesting blog post and photogrpahy about the Belted Kingfisher can be found here on the Pacific NW Backyard Birder blog. I found a momma raccoon and three babies in the abandoned Swainson's Hawk nest near the Avimor entry towers. They looked snuggled and cozy. Perhaps they are the reason the nest failed in the first place. Avimor residents have been reporting raccoons eating their cat and dog food. Anyway, another great morning of Idaho birding at Avimor. Twenty-one species total including a handsome little House Wren, a flock of Cedar Waxwings flying overhead, and a pair of super cute Black-capped Chickadees feeding on a sunflower. What in the birding world is a Big Sit?! A Big Sit is like a tailgate party for birders. On a specific day, birders from all over the world select a spot that has good views of a variety of habitats in which they will hopefully see as many different bird species as possible in a 24 hour period while confined to a 17' diameter area. The official Big Sit! put on by Bird Watcher's Digest will occur on Sunday, October 11th. I am not quite up to that challenge this year, but I figured why not have a small-scale Big Sit in the foothills in lieu of our regularly scheduled bird walk. We will comply with the official Big Sit! rules of play with exception to the date and duration. I plan on choosing the principal location for the morning. If we have enough interested participants, we will create multiple teams. At that point other viewing locations at Avimor would be selected. If you want to form your own team and select your own location, you are absolutely welcome to. A little friendly competition would make it even more fun! Birders of all ages and experience levels are invited! You don't have to be there the entire time. What should you bring? Binoculars and spotting scope if you have them, something to sit on, and snacks to get you through the morning. I'll provide coffee and hot chocolate, a small table for my circle, checklists of birds, plenty of bottled water for everyone participating, two-way radios, and maybe even some prizes. If you are interested, please let me know by clicking "Ask the Avimor Bird Guy" in the right column to send me an e-mail. Come on out and Sit with me! It'll be fun! Five adults and three young aspiring naturalists joined us this morning for the Avimor Bird Walk up Spring Valley Creek Trail. The Sharp-shinned Hawks and Northern Harrier were nice surprises. The abundance of Spotted Towhees was shocking. Foreboding of a strange and mysterious birding day. And disappeared with the masked-faced Sora. Stared down ominously from above. Demon gargoyles guarding, silently watching. I fled the other way. How much longer could it last? How much longer would I last? Was I beckoned forth to die? A happy omen I begged of the Divine. Was this to be my end? And I the giant to be slain? Then zipped merrily on its way. I lived to share the tale. 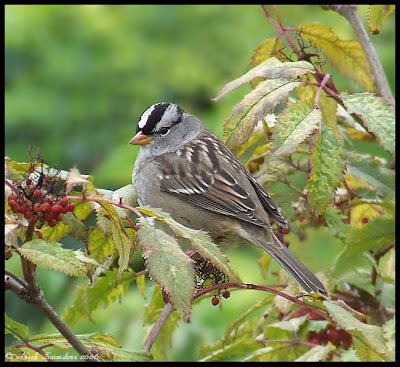 While a pair of juvenile Western Tanagers were still bulking up to head out of town, three White-crowned Sparrows made thier appearance this morning along Spring Valley Creek Trail. There is a great variety of winter food supply along the creeks and draws in the foothills. We can be expecting Ruby-crowned Kinglets and Dark-eyed Juncos in the near future. Over the last couple of weeks I have been observing certain species of birds that are congregating into flocks, fattening up on seeds and insects, preparing for winter migration. This morning we had 50+ Western Meadowlarks in the wildflower field on the north side of Avimor Drive. I have never seen so many together. I can only assume that they gather for migration. Based on location maps, it appears that Western Meadowlarks don't go too far as they can be found along the west coast and the southwestern states year round. I also watched a flock of Red-winged Blackbirds in the tall cottonwood trees along Spring Valley Creek. Their plummage looked pristine, especially compared to the rough looking bunch I saw a couple weeks ago. Red-wings do winter in Idaho, but they appear to flock together and to be found in only certain locations. The Brewer's Blackbirds still seem to have a couple of flocks around Avimor. 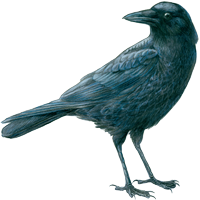 The Celebrate Urban Birds folks with the Cornell Lab of Ornithology is having a Spooky Bird Contest called "A Murder of Crows and other Spooky Bird Tales". C.U.B. regularly has these fun and interesting online events. Last quarter was the "Funky Nests in Funky Places" contest in which Avimor resident Janis LaFluer participated. Click on the links for more details. I will be submitting an entry; not a photo but a story. I just need to figure out if I want to compose it in prose or poetry. Perhaps some poetry Edgar Allan Poe "The Raven" style for the spooky Halloween effect.